Modern Off Grid Prefab House Grass Is Always Greener. 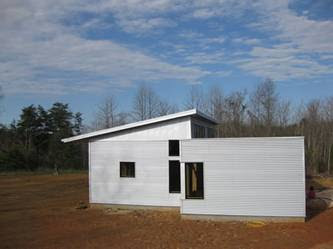 Beautiful weather, green grass, modern off grid prefab... hey, what's that?!? The client of the Dogtrot Mod modern prefab cabin in the Northeast has returned, and we, with the contractor, distributor, and architect, are back on track. What will be different on this Dogtrot Mod modern prefab house in the Northeast is that instead of piers, they will have a basement, and the deck will be enclosed. At our own off grid modern prefab house, we have been busy. 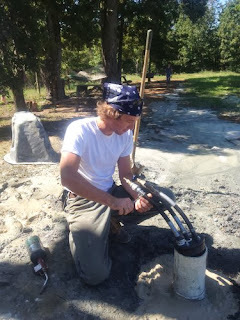 If you have read this blog awhile, you know well my battle to cover the Virginia clay that predominates about the home site. I have seeded clover, fescue, rye, wheat... every year, I sow. From last week- look at all that grass! As I explained to an Amish friend this week, in Years 1 and 2 at the off grid prefab house, the kids and dogs would track that clay in, the dogs paws would be FULL of it. That clay then turned to dust and rose up, covering our books, furniture, windowsills... staining bedsheets and towels... terrible. Not what you exactly think of when you think of a clean, modern home, no? Clean modern prefab house + lots of clean modern mud. Then, finally, the grass took hold! I rejoiced. Then in Year 3 we dug a livestock well, and the well diggers chose the yard for their focal point.. which worked fantastically from a well-to-cistern engineering standpoint, but, well, two steps back to mud and dust. Livestock well dug = granite dust spewed over the yard. Then the grass grew back!!!! I really rejoiced. After years of cleaning out construction dust and mud from the shelves and crevices of my modern prefab home, suddenly dusting this year became easy. Now we ready to bring our horse home this fall. To do so, a run-in must be built, with hay storage, fencing, and lines run to the field to pump water. I excitedly welcomed our neighbor B. as he and his crew arrived to run the water lines! Gah! I can't watch. They're digging too close to the prefab house! Miracle of miracles they did NOT cut the internet cable. The chickens jumped into the ditch and started racing back and forth- they looked like SHARKS eerily "swimming" about my yard. A lone rose bush takes a stand against ditches and mud. Finally, she encouraged: "Well, I do see you DID grow grass because if you look REALLY CLOSELY you can see patches of green...!" In the end, all of this hard work and mess is worth it. Operation Bring Zena Home is in full swing. While I quietly retreated into a corner to sob into my coffee as my yard became a Manic Treasure Hunt... Handsome Husband was busy framing out hay storage and a run in with a father and son. When our first batteries began to fail last winter, only working at 60-70%, our friend S. said, "Hey, I know of an off grid family who could really use those!" I deferred, "Oh, no, they don't want them..."
But his friends thought otherwise. We loaned them 2-3 of the batteries to see if they could get them humming, and weeks later P was back, telling us how much after living off grid with NO battery backup for years they had made their family's life much easier. We were all thrilled for each other! And so, when it came time to frame the run in, P's family and our family worked together, both families thrilled to be each gaining something that would improve each family's lives, and both of us happy to now have another family to call a friend. While P, his son, and Handsome Husband worked, the Pips ran back and forth relaying messages, helping to move beams, carrying up cold water, and delivering freshly-cooked omelette to keep their spirits high. In the hot afternoon, we sent up ice cream. Hay storage framed out, now to add run-ins on either side.